My card today uses the In This World stamp set. I love this stamp set because it's fun to create a collage style card. All supplies and measurements for this card are listed at the end of this post, so scroll down for that info! I used Crumb Cake ink and several stamps for a tone on tone look for the first panel of my card. I repeated this with the chair stamp with Flirty Flamingo ink and Flirty Flamingo cardstock. The focal point of the card is the Very Vanilla cardstock - stamped with the door, and cut apart into smaller pieces, and attached to the Flirty Flamingo panel. I wrapped Linen Thread around this entire piece, added a small piece of a doily, and attached this to the card front with dimensionals. 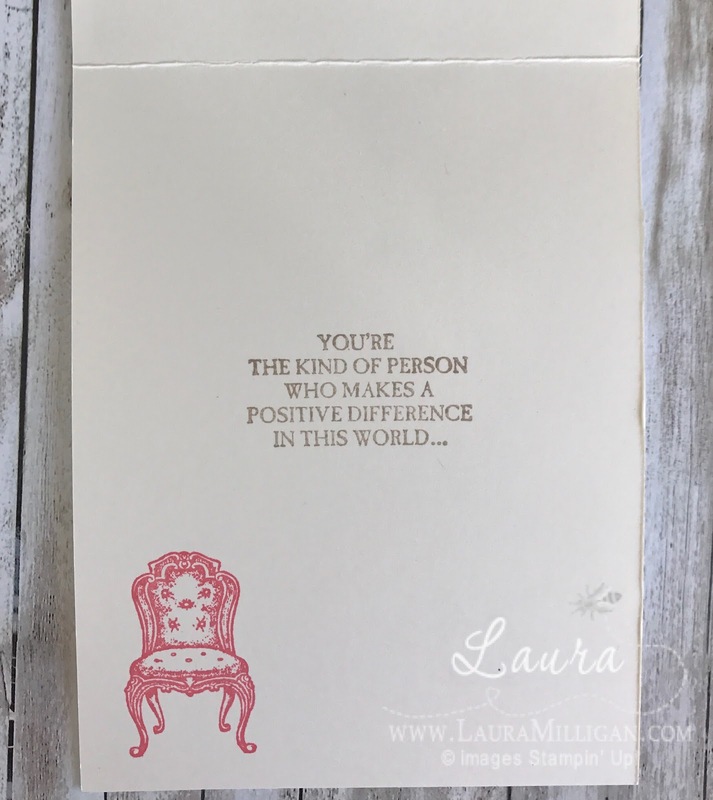 To finish the card, I created a small tag - I stamped the key and the word Happiness on a small piece of Very Vanilla cardsdtock - I cut around the curved part of the key to create a rounded edge to the tag. I created a tassel of linen thread and added two small pearls. 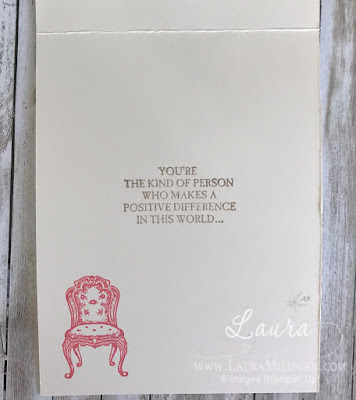 For the inside of my card, I stamped the words, and the chair image. Stampin' Up! has added several new FREE products to the Saleabration choices for the remaining days of Saleabration (ends March 31). Sale-A-Bration has flown by! Times flies when you’re having fun, though, right? Only a few days are remaining during Sale-A-Bration— the year’s biggest promotion. We have added additional products for you to sell and earn to finish off Sale-A-Bration strong. Don’t forget you have until March 31 to earn free products, recruiting rewards, and hosting rewards. Fun to have a few more choices!! And don't forget about my special offer this month - a FREE ink pad of your choice! Here are the products used in my card, with clickable links, should you want to shop my store! Flirty Flamingo: 3 3/4" x 3 1/2"